That sensation you feel when you meet someone you like—that visceral pull towards another human being—there's biology behind that. And if there's biology behind that, it can be measured, and controlled for, and used to help determine if two people will be attracted to each other before they ever even meet in person. 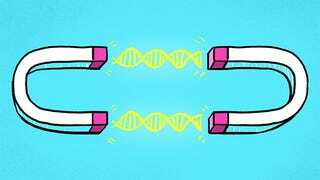 That's the theory behind a new wave of online dating trying to radically improve the matchmaking process by analyzing your DNA. As it happened, I set out to write about SingldOut, a dating website that tests users' genetic compatibility, just a few months after having deactivated all of my online dating profiles. It wasn't that I had met someone, but rather because I realized how much time, effort, and thought I'd wasted maintaining and engaging with the platforms themselves—in my case, OkCupid, Tinder, and Hinge. Then again, I figured, maybe spitting into a bottle would do the trick. So, I updated my LinkedIn info (SingldOut markets itself to young professionals) and signed up. A week or so later, a plastic bottle arrived in the mail, into which I was invited to deposit my saliva. The problem DNA dating aims to solve is that chemistry in correspondence is, unfortunately, no guarantee of chemistry in person. "A lot of people waste a lot of time with online dating. We want to save people's time," Elle France, co-founder of SingldOut, told me in an interview. "Wouldn't you want to know online whether you have chemistry with someone offline?" SingldOut isn't the first business to attempt to incorporate gene testing or some form of biology into dating services. For some time now people in Los Angeles and London have been exploring "pheromone dating," where you physically smell other people's anonymous dirty clothes, and if you like the smell are then introduced to the person whose smelly clothes you enjoyed. One startup, Basisnote, was trying to turn these meetup events into a more broadly distributed business model by assigning love-seekers "smell profiles" that can be shared on a dating platform. Then there's GenePartner, founded eight years ago, which offers a singles who have met on other dating sites the opportunity to assess that elusive chemistry before ever meeting in person. The SingldOut DNA test measures two sets of genes: One is related to determining the length of your serotonin transporters and the others, the Human Leukocyte Antigens or HLA—are indicators of the immune system. This is based on research that suggests the serotonin gene can gauge your susceptibility to depression, and that people are more attracted to people whose immune systems are dissimilar from their own (a biological failsafe left over from the days where humans had to worry about mating with a relative). To the dismay of romantics everywhere, science can explain away that initial attraction to a potential mate. "A long time ago, things that happened outside and inside our bodies that we didn't understand were thought of as magical or divine," GenePartner founder Tamara Brown told me. "There is an intrinsic system in the human body—with hormones and neurotransmitters pathways—which you can read like this: I like her/him. It's not the bright smile, it's not the blue eyes or the long wavy hair—it's something else. And people can't put their finger on it, they just feel it's something." "Science explained a lot of things," she added, "and this one is exactly one of them." But whether the magic of finding that person who twists your insides up in the best possible way has a biological solution is still very much an open question. "There is very likely some genetic component to attraction," Joshua Akey, director of a genome research lab at the University of Washington, explained. "But it is exceedingly complex, and beyond our understanding right now." The entire human genome comprises tens of thousands of genes, and very little is known about the way genes affect complicated behavior like attraction between two humans. "It is naive to think that complex traits can be predicted by four genes out of 20,000," said Akey. "There's probably only a fraction known about the genetic component to attractiveness, and certainly not enough to determine its effect on behavior." "Genes are important," Akey said. "But they're not everything." Past studies exploring the link between genetics and romantic attraction have been controversial and inconclusive. A 2010 meta-analysis of research on the serotonin transporter gene presented no evidence that the genotype "is associated with an elevated risk of depression in men alone, women alone, or in both sexes combined." An earlier meta-analysis of the research on the relationship between the immune-system genes SingldOut tests and attraction was similarly inconclusive. Still, France insists the science behind SingldOut is solid. "It's not some kind of marketing scheme," she told me. "We really want to help people." As the website's own fine print notes, however, because the site doesn't offer medical, diagnostic services, it is not subject to oversight from the Food and Drug Administration or compliance with the Health Insurance Portability and Accountability Act. In other words, it might be brilliant, but it might be bunk. Date at your own risk. "Forty percent of attraction is in our genes," France said. In October, SingldOut raised $600,000 in seed funding on the idea that our genes are, as France puts it, "just another set of filters." If 40 percent of attraction is in our genes, the other 60 percent would presumably comprise of, well, the rest. You know, things like conscious and unconscious beauty standards and behavioral expectations prescribed by race, gender, and class and probably influenced by your parents. And also the movies that you like. There's a lot going on in that 60 percent. Adding biological clues into the mix taps into that mysterious world of sexual and romantic chemistry, theoretically maximizing the chances of finding good match, so you're spending less time on unsuccessful dates—to "bridge the gap between the digital and biological world of Love," as the SingldOut website puts it. "One can have 30 different dates with different people before one finds a real good fit," Brown said. Or, "one can cut this time from 30 to three dates—and those three have a perfect genetic/body chemistry fit. I truly believe this helps people to find their partners faster and I think in time it will become 'a must' in the dating field." As for France, before she started at SingldOut she worked as a high-end matchmaker at a dating app, Ellefrance.net. Her clients paid thousands of dollars for her services, and as such had very high expectations about what she could do for them. Working as a matchmaker, she learned something: "People don't give you the truth about who they are; they tell you who they'd like to be," she said. "Your DNA doesn't lie." SingldOut offers a free 30-day trial membership, but in order to get the DNA kit you have to pay the "Gold Membership" fee—a six-month subscription costs $199. A couple weeks after signing up my results were in, displayed right there on my profile alongside all the other boring stuff: where I'm from, what I do, and what I'm into. I have to say, I was not impressed. The service is not yet especially popular in New York City, and my daily batch of five suggested matches included women in Schenectady, Baltimore, and Springfield, Massachusetts. On its own, what I was told about my "HLA Composition" is essentially meaningless: my HLA-A gene is A10-A9; HLA-B, B37-B50; HLA-DR, DR13-DR9. It's only in relationship to somebody else's composition that this has any significance—which, again, is a tenuous scientific claim to make. And even if it did, so what? Just because you have physical chemistry with someone doesn't mean things are meant to be, as anyone who's slept with an ex can testify. The promise of dating sites is in codifying attraction—categorizing it, filtering it, making it explicit and measured and rational. But online dating, whether it involves our DNA or an algorithm based on survey answers, is a pseudoscience—a promise based in some fact or another that we grab onto for dear life rather than accept that we are alone, for now, and for the foreseeable future, and that that is okay. It's no easy thing to trust that, eventually, in due time, you will meet someone who makes you feel good, and comfortable, and at home again. I did not find this person with a DNA kit. But in the course of writing this story, I did end up re-registering with OkCupid. The promise is an alluring one.